I’m feeling so much better today than yesterday. Sometimes the overwhelming feeling of just beginning the project is so much worse than actually doing it. Not much time to write and reflect today, I still have several projects to tackle. Oh, and Mom, no, you’re right, that was NOT a photo of your sewing drawer. 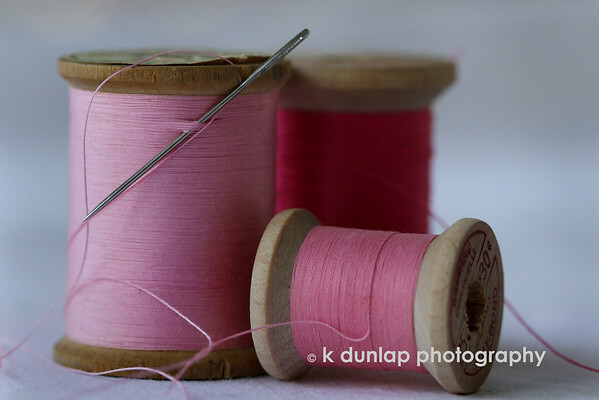 (Or mine) Today’s photo is a sample of my Mother’s sewing drawer. ALL her thread is color coded and always organized. I really like the setup and focus on this. Sounds like the way my mother used to have her sewing drawer. Perfect opposite of yesterday's shot - love them both! I really like this one! Great detail and doff, wonderful coordinating color in the threads. Quite a nice straightforward shot with great detail and shallow dof. This is really nicely done. I like the simple composition and the shallow depth of field. I actually came across some spools of thread in a drawer last night and was thinking of arranging some photos with them, so I might post something in this genre in the near future. I love the fact that you've taken something so simple with such clarity and turned it into beautiful. (Plus I'm really drawn to the color pink).